Pete Hueseman, R.Ph., P.D., Power Surge's Resident Pharmaceutical Consultant for 9 years, has been a Registered Pharmacist since 1973, and is a graduate of St. Louis College of Pharmacy. He has specialized in the women's healthcare field for the last 15 years. Pete was formerly with College Pharmacy. 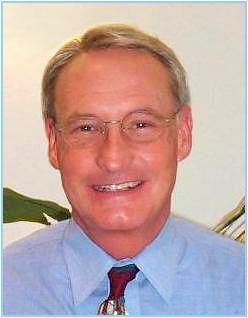 His Bellevue Pharmacy Solutions is devoted to compounding prescription (natural) hormone products (progesterone, estradiol, estriol, estrone, tri-estrogen, DHEA, testosterone, pregnenolone), and specializes in counseling patients and physicians nationwide on the use of natural hormones. Pete Heuseman is an acknowledged expert on the use of natural bio-identical hormones for HRT (hormone replacement therapy). Pete encourages everyone to call him at 1-800-728-0288 and he'll be glad to answer any and all questions about menopause and natural compounded prescription hormones. Professional Affiliations are: North American Menopause Society; ACAM - Academy of Alternative Medicine; Alternative and Complementary Medicine Association; American Society of Reproductive Medicine; Missouri Pharmacists Association; St. Louis Pharmacists Association (member and past President). Feel free to ask any questions of Pete Hueseman on the Ask The Pharmacist page. Produced by the ovaries and is the principal estrogen found in a women's body. Often referred to as the "parent hormone" pregnenolone is synthesized from cholesterol. It is a super-hormone that is the key to keeping the brain functioning at peak capacity. Believed to be the most potent memory enhancer, it has also been shown to be beneficial in improving concentration, fighting mental fatigue and relieving severe joint pain and fatigue in arthritis. A study by Dr. Kendall Dupree of Johns Hopkins University looked into the effects of soy on quality of life in post-menopausal women. Complementary and alternative therapies are being used frequently in the United States. Studies of post-menopausal women indicate that estrogen replacement improves physical, psychosocial and vascular symptoms. Because of the reduction in use of hormone replacement therapy, many women are choosing soy as an alternative. Soy is a phytoestrogen, which is a naturally occurring estrogen found in plants. It contains isoflavanoids called genistein and daidzein. These isoflavanoids are similar to estrogen chemically and are capable of binding to estrogen receptors and exerting an excitatory or inhibitory effect. The study looked to demonstrate that when administered in adequate doses to post-menopausal women, isoflavones will result in improved menopausal symptoms and related quality of life. The study looked at data on 35 post-menopausal women not on hormone replacement therapy for at least six months prior to beginning the study. Participants completed a three-month clinical trial and were randomized to the active product, commercially available as Revival, with 160mg of total isoflavones vs. a placebo. Each participant completed the MENQOL (Menopause- Specific Quality of Life Questionnaire) at baseline, six weeks and three months. Researchers found that women taking the active compound experienced significant improvement in their vasomotor symptoms, psychosocial symptoms and physical function by 36%, 40% and 30 % respectively, compared to the placebo. "We conclude that post-menopausal women taking isoflavones with high concentrations of genistein experience improvement in their menopausal symptoms and therefore have an improved quality-of-life, as reflected by the self-administered MENQOL questionnaire," said Dupree.